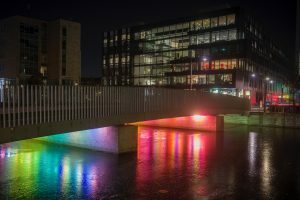 Copenhagen Light Festival will show your outdoor works to visitors in central Copenhagen – citizens as well as tourists. Your art installations and your name will be displayed on our digital platforms, and will be part of the secretariat’s active promotion toward national and international press and other organisations such as Visit Denmark. The secretariat will (if needed) connect you to potential sponsors and light hosts, so have your portfolio ready! To be able to promote the installations, all artistic contributors should, free of charge, provide the secretary with text and photos/visualizations of the installation.